It’s kind of ironic: although it’s in the business of energy, the oil and gas industry is facing an impending shortage of its most precious resource—people. 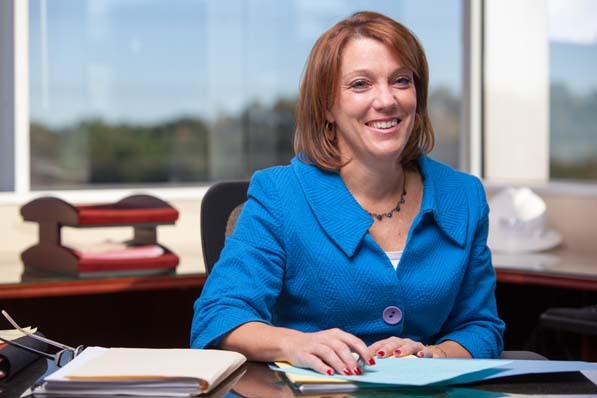 So suggests Jenny McCauley, senior vice president of human resources at Southwestern Energy Company (SWN), a Houston-based enterprise that specializes in the exploration, development, and production of natural gas and crude oil. After two decades practicing human resources in the hospitality and financial services industries, she wants to infuse the energy sector with the ultimate renewable resource: talent. Here, she tells Profile why she’s doing it and how. What is your driving HR philosophy? Jenny McCauley: HR is a steward of the culture; we must make sure an organization has the right focus on a major driver of business results—the people driver. We work with leaders to facilitate the achievement of business results, whatever they are, through people. You started your HR career in the hospitality industry, at Hilton Hotels, spent a short time at Aramark in managed services, then spent 10 years in the financial-services industry with JPMorgan Chase. Now you’re in oil and gas. What’s unique about HR in energy compared to these other fields? McCauley: The focus on the technical side of talent and experience in this industry is key to success and, historically, has been the most critical thing when hiring people. In addition, communities and customers now expect more from our industry, and a stronger focus has been put on the technical and the behavioral aspects of our talent. The petro-tech talent pool—engineers, geologists, geophysicists, etc.—shrunk in the past due to the cycles of the industry back in the ’70s and ’80s. Oil and gas was not considered a hot or exciting place to work. As a result, for a number of years you saw a significant drop-off in the number of college graduates in the petro-tech disciplines. Now there are almost twice as many people nearing retirement as there are replacements to come into those roles. What does that mean for the industry? McCauley: It is an industry issue that clearly lends itself to many different HR issues and opportunities. We have people whose learning has to be accelerated, so we have to ask how can we use technology, job experiences, or mentor-type relationships to accelerate an employee’s technical learning. At the same time, how do you transfer knowledge and create replicable processes across the divisions and business units in the organization? How can we plan or redefine the jobs to keep retirees in the industry, for example, by creating a technical academy and using this key talent as technical coaches or advisers? Another key to our success is the focus we place on building future leaders—how well we can transition key employees effectively and quickly to [make them] well-rounded and strategic leaders. Southwestern Energy is a leading player in Arkansas’s natural gas industry. 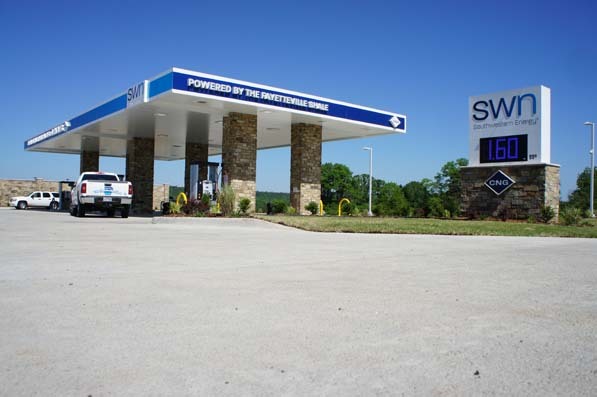 SWN’s compressed natural gas station in Damascus is open to the public, providing clean-burning fuel to its own fleet and its neighbors. You joined SWN in 2009. How are you preparing the company for this impending talent crisis? McCauley: While we don’t specifically focus on the talent shortage, we are very cognizant of the cycles in the industry and the limited talent pool. One of the things we are doing is looking ahead to plan for what we will need for our future—across technical capabilities, services, support staff, HR, etc. How are you readying your team to handle this task? McCauley: There is quite a bit of literature regarding the 2020 workforce and work environment, so I asked the HR leadership team to go out, research, and then come back and present their view of our HR team in 2020, including internal and external influences. The end result has been a different way of looking at our capabilities in HR, specifically how we are organized and how we deliver value. We then, in turn, support and enable the organization using value as determined by the stakeholder group—employees, managers, teams, organization, shareholders, communities, and so on. Another thing we are doing is preparing our future leaders to be strategic, enterprise-minded leaders who inspire commitment, collaboration, and motivation of their teams. McCauley: Using the information we gathered about the future workforce, we developed a program to build and refine the skills of future leaders. We partnered with Rice University, the Center for Creative Leadership, and Heidrick & Struggles to deliver a comprehensive program with key topics—Leading SWN, Engaging the World, Building Talent, and Leading Yourself. We selected 12 future leaders as our inaugural group and have seen great success so far, such as strong cohort building and bonding that likely would not have happened on its own, a few promotions, and many others working on key strategic initiatives for SWN. We want to give [this group] the exposure and experience of the senior leadership environment so that they can develop key areas and also think about their career aspirations based on the realities of senior level role requirements. What have been your key findings coming out of this initiative? McCauley: We found that the future requires a different HR mind-set than we have today. We need to move beyond standard reporting into logic-driven analytics to help our stakeholders determine needs and the timing of those needs so we can deliver the best solution—do we build, buy, or borrow? Another aspect of the new mind-set is much more segmentation of our stakeholder base. We need to know the specific value proposition per stakeholder so that we can deliver the “so what,” plus a little more. That is what we call at SWN, V+. We also need to work harder at increasing the synergy of our HR programs. Finally, as with many HR functions, we need to be more crisp about optimizing the return on our HR investment—letting information drive our decisions versus ongoing programs or things we have done in the past. As a function, I want to know where we should invest more so that it makes a difference to our shareholders and other stakeholders. We are passionate about uncovering a more linear path from our HR investment to our stock price. Have the results of your 2020 findings changed the way you approach HR as an organization? McCauley: Yes, we reorganized our team according to the stakeholder groups and things we discovered in our research. We started with the key stakeholders—employees, managers, teams, etc.—and thought about what they want from an HR team. We then rearranged our team according to our findings. What does the new HR function look like? McCauley: We have an Employee Experience team that provides solutions to the question, “How do employees feel about working at SWN?”; an Organization and Team Effectiveness group that provides solutions to the people plans, strategies, and requirements needed to deliver against our plan; and a Planning and Analysis team that ensures we use logic-driven analytics and that our HR outcomes are aligned with the SWN business plan and, ultimately, our stock price. Beyond your research, what drove you in this direction? McCauley: Our CEO gave me a challenge to “figure out how [HR can] be the cool product that everybody wants versus the product everyone knows they need.” That challenge has shaped our decisions and thinking about what we deliver, how we deliver it, and why we deliver it. For example, Apple products are innovative because they are technically sound, cool, and give you information at your fingertips—what you need, when you need it. If you don’t have something you need, they make it easy for you to find it. I want our HR team to be that type of product. SWN is more than 80 years old. Even as you embrace its future, how are you preserving its past? McCauley: We have a formula at SWN, which is the foundation for how we go about our business, that literally means: “The right people doing the right things, wisely investing the cash flow from our underlying assets, will create value plus.” Our company has a tremendously rich and fascinating history that has defined who we are today and who we want to be in the future. We want to make sure that, as we grow and expand into new locations with many new people, we don’t lose the spirit and passion of who we are.